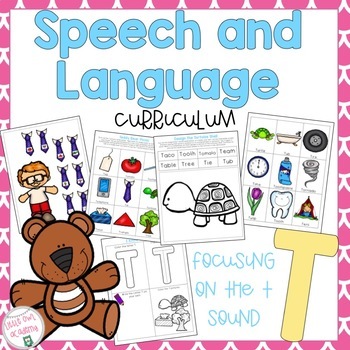 T sound Speech and Language Preschool Curriculum is a huge packet focused on speech and language curriculum and activities. 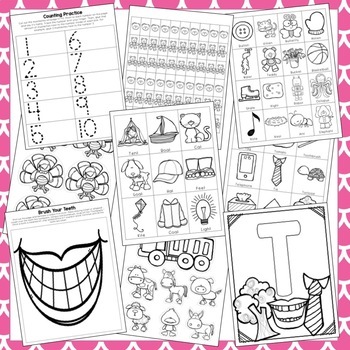 It contains 46 pages of printable pages, activities, resources, tips, instruction, and ideas. There are gross motor activities, fine motor skills, letter and number practice, books, songs, and more. This has everything you need to work on the T sound with your students or child. All the pages that your student will work on will come in color and black and white. The instruction pages are just in color. Loading the Blue Truck full of T animal sounds. Brushing your teeth and practicing T words.